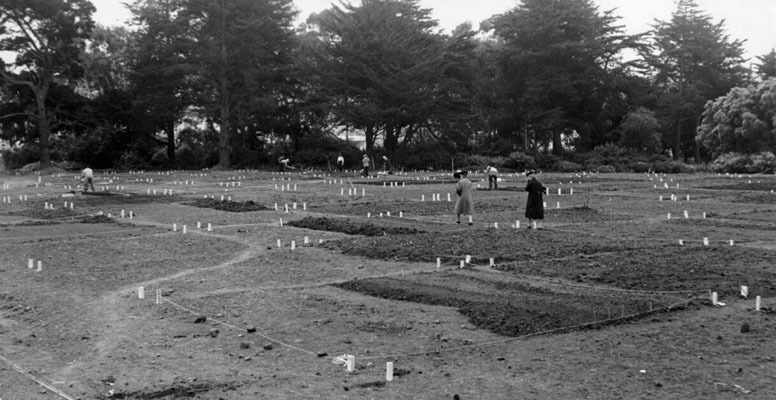 Community gardens have come and gone in Golden Gate Park over the years. 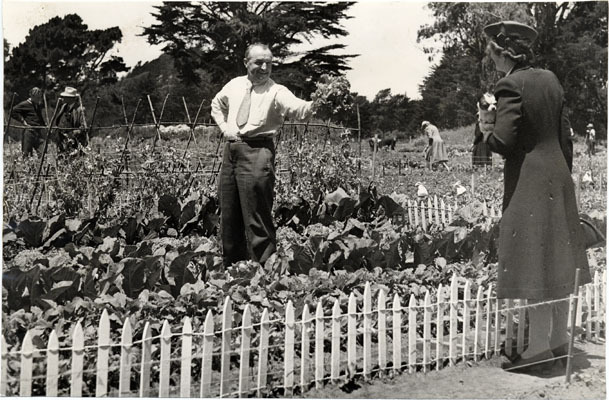 The pictures show victory gardens in the park during WW II. The following KALW story describes a new garden where vegetables are growing communally in the park. “San Franciscans love to garden, but a backyard is hard to come by if you live in an apartment. And the 36 city-operated community gardens have wait lists with hundreds of names on them. That’s why the San Francisco Recreation and Park Department had to get creative on the Golden Gate Park Community Garden. It opened last November on the northwest corner of the park, situated between busy Frederick Street and a dramatic living wall of native plants. In order to meet the high demand for garden space, half of the 67 raised garden beds are cared for by individual households, and the other half are managed by teams of total strangers. “Our team got together and sort of strategized on how can we bring folks together and our concept was actually one of speed dating,” says Melinda Stockmann, who oversees all community gardens for the city. The plot sharing experiment was her brainchild. It sounds like an episode of NBC’s “Parks and Recreation,” but it’s really more like a dating show. Stockmann led the garden buddy meet-up last August, asking questions to identify common interests and gradually pairing total strangers together. Some people got together because they wanted to plant pollinators, others found partners based on their experience level. “It’s going to be up to those each individual teams whether they want to just put twine down the middle and straight subdivide or do they want to communally manage and all decide on their planting plan and harvest together,” Stockmann says. One group is comprised of a retired couple and two people who had never met. They decided to use their plot for veggies and are happy sharing in the harvest together. So far great relationships are growing at the community garden. “I love the fact that it’s a shared effort and it’s a wonderful way to get to know people,” says Steven Fields, another gardener in the group. Working with a married couple, John and Margaret Castro, has been rewarding. “It’s like Christmas morning when I come here on the weekends and find there’s something new here,” he says. via Must love broccoli: A community garden plays matchmaker | KALW. 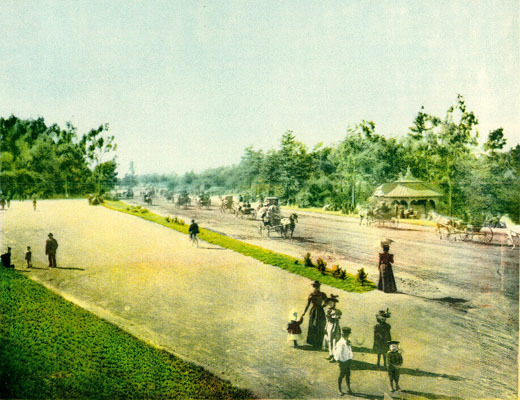 This entry was posted in eating, gardens, people, plants and tagged community gardens, golden gate park, golden gate park history, urban farming, urban food systems. Bookmark the permalink.